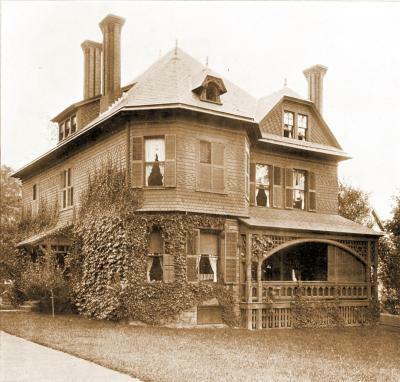 This was the parsonage (or rectory) of the Church of the Unity, which was on State Street across from the Springfield Public Library Main Branch. The church was torn down in the 1960s, and the site is currently a parking lot for the library. I don't know if the parsonage was torn down then, or earlier, though a realty map published in 1946 shows the building intact. Submitted by Claudia (not verified) on Mon, 09/03/2012 - 16:55. The house pictured is the parsonage of the Church of the Unity. I attended Sunday school there in the 40's and 50's. Submitted by Anonymous on Tue, 01/22/2019 - 14:53. Owen Whitman Eames was the pastor here. Submitted by Jim Boone (not verified) on Mon, 04/16/2012 - 07:26. I do not know if the picture above posted by Ralph is the "parsonage" but it is the house that was west of the Church of the Unity as depicted in many post card images. I do not know when it was demolished, so sad to see both of those buildings gone, we must work hard to save what is left. Submitted by Dave Gaby (not verified) on Sun, 04/15/2012 - 22:33. I grew up as a member of the church and worshiped in the H.H. Richardson building on State Street. This was not the house adjacent to the church. It may be the parsonage that I heard was on Mill Street, or it may be another parsonage. Submitted by Kerry (not verified) on Sat, 10/09/2010 - 21:55. This is a really great find. I am in the process of assembling some history of the Unitarian Universalist Society of Greater Springfield, which is the church that comes from the Church of the Unity on State Street. I am also looking for images of the church as well.